Nothing in particular. The lack of air conditioning made for an unpleasant stay. The room was fabulous, perfect size for three people, bed were quite comfortable. Prefect location, close to everything. Couldn’t fault a thing well run organised breakfast buffet good value if you book the week you get a day free, could get sunbeds all day, friendly staff, clean rooms and hotel areas, would book again great location !! Location could not be any better! Next to Yumbo, short walk to the beach. Really friendly staff who always took in consideration our small baby. Breakfast was really good! Loved it.we have been going to the Buenos Aires on and off for the last 28 years. Lock in a great price for MUR Aparthotel Buenos Aires Gran Canaria – rated 8.7 by recent guests! 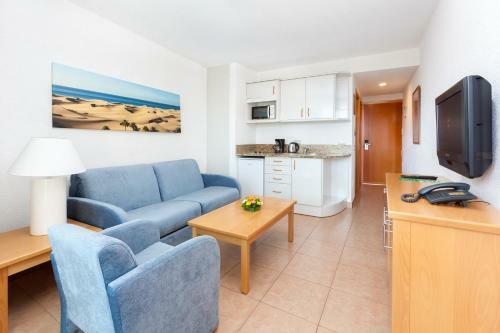 MUR Aparthotel Buenos Aires Gran Canaria This rating is a reflection of how the property compares to the industry standard when it comes to price, facilities and services available. It's based on a self-evaluation by the property. Use this rating to help choose your stay! Aparthotel Buenos Aires is in the center of Playa del Ingles resort, half a mile from the beach. 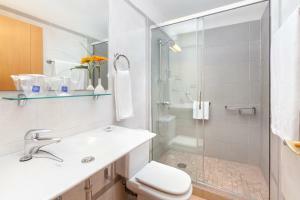 It offers a free Wi-Fi zone and apartments with a balcony overlooking the outdoor swimming pool. Buenos Aires Apartments are next to the resort’s lively Yumbo Shopping Center, with its many bars, shops and restaurants. Modern apartments feature flat-screen satellite TV and a living room with a sofa bed. There is a private bathroom and a kitchenette with a fridge, microwave and coffee maker. Aparthotel Buenos Aires has a restaurant, TV room and piano bar. Snacks are available at the poolside bar. The complex has a 24-hour front desk, where you can exchange currency or rent a car. Maspalomas Golf Course is one mile away and you can drive to Gran Canaria Airport in 20 minutes. When would you like to stay at MUR Aparthotel Buenos Aires Gran Canaria? This apartment has a sitting area with a sofa bed and a satellite flat-screen TV. It has a balcony with a pool view. This superior apartment features air-conditioning and a free safe. A bottle of sparkling wine is included. House Rules MUR Aparthotel Buenos Aires Gran Canaria takes special requests – add in the next step! MUR Aparthotel Buenos Aires Gran Canaria accepts these cards and reserves the right to temporarily hold an amount prior to arrival. Please note that in the case of Non-Refundable rates, the other 50% of the reservation will be paid upon check-in. no remarks to this stay. I was not expecting a non air conditioned property, and did not know this until arrival in the room! The building is described in advertising as modern, which it is. I accept I did not specifically look for the words air conditioned, but I don't do this in any of the multiple properties around the world that I stay each year, and they are always air conditioned. The price charged would certainly be similar to 4 star a/c hotels in the area. This property overlooks a noisy night venue, making open windows impossible. I feel very strongly that A NON AIR CONDITIONED PROPERTY information notice should be clearly shown on the agents sales pages. I used the bedroom with windows closed to try to sleep (not successfully), whilst my travel friend decided to make up a bed on the balcony, and accept the noise (again, unsuccessfully). The sitting room was smaller then the pictures but was okay, there wasn’t a great selection on the breakfast buffet, went else where for breakfast most mornings. Also the microwave sounded like it was going to explode. there are not any Italian or french channels on the television . this is very bad because there are many Italian guests in the yours apartments and it will be very nice if you solve this problem.